GOLDEN, Colorado, September 14, 2010 (ENS) – The potential of offshore wind power in the United States to generate electricity is at least four times as great as the nation’s total electric generating capacity from all sources in 2008, finds a new assessment by the National Renewable Energy Laboratory. Issued Friday, the NREL report presents the first draft of a national validated offshore wind resource database needed to understand the magnitude of the U.S. wind resource and to plan the distribution and development of future offshore wind power facilities. No offshore wind farms currently exist in the United States. Wind availability and distribution is characterized by level of annual average wind speed, water depth, distance from shore, and state administrative areas. The estimate does not describe actual planned offshore wind development, and the report does not consider that some offshore areas may be excluded from energy development on the basis of environmental, human use, or technical considerations. The “Assessment of Offshore Wind Energy Resources for the United States” shows that 4,150 gigawatts of potential maximum wind turbine capacity from offshore wind resources are available in the United States. According to the U.S. Energy Information Administration, in 2008 the nation’s total electric generating capacity from all sources was 1,010 gigawatts. The NREL report’s estimate is based on the latest high-resolution maps predicting annual average wind speeds, and shows the gross energy potential of offshore wind resources. The potential electric generating capacity was calculated from the total offshore area within 50 nautical miles of shore, in areas where average annual wind speeds are at least 16 miles per hour at a height of 295 feet. The research team assumed that five megawatts of wind turbines could be placed in every square kilometer of water that met these wind characteristics. Detailed resource maps and tables for the offshore wind resources of 26 coastal states’ bordering the oceans and the Great Lakes break down the wind energy potential by wind speed, water depth, and distance from shore. In May 2008, the U.S. Department of Energy released a report detailing a deployment scenario by which the United States could achieve 20 percent of its electric energy supply from wind energy. Under this scenario, offshore wind was an essential contributor, providing 54 gigawatts of installed electric capacity to the grid. “When President Obama took office in January 2009, his message clearly reinforced this challenge in a broader context of energy independence, environmental stewardship, and a strengthened economy based on clean renewable energy sources,” the authors state. But many technical and economic challenges remain to be overcome to achieve the deployment levels described in the 20 percent wind report, the authors acknowledge. “Many coastal areas in the United States have large electricity demand but have limited access to a high-quality land-based wind resource, and these areas are typically limited in their access to interstate grid transmission,” they say. The new database will be periodically revised to reflect better wind resource estimates and to include updated information from other datasets. It is intended to serve as the foundation for future modifications that may include specific exclusion areas for the calculation of the nation’s offshore wind resource potential. Offshore wind projects totaling more than 5,000 megawatts have been proposed and are in the planning or development stages in the United States and interest in offshore wind power development is growing among governments and also in the private sector. On July 14, the American Wind Energy Association, AWEA, the national wind industry association, announced the formation of the Offshore Wind Development Coalition, called OffshoreWindDC. 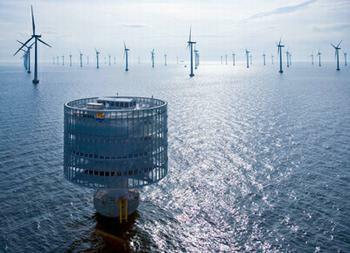 The new coalition will focus on advocacy and education efforts to promote offshore wind energy. Founding members and contributors to the Offshore Wind Development Coalition include the corporations Apex Wind, Cape Wind, Deepwater Wind, Fishermen’s Energy, NRG Bluewater Wind, OffshoreMW, and Seawind Renewable. The new coalition will join AWEA in working to secure long-term tax policy for offshore wind and shorten the permitting timeline for projects. The effort will involve AWEA, offshore wind developers, and other stakeholders in states such as Maine, Massachusetts, Rhode Island, New York, New Jersey, Delaware, Maryland, Virginia, North Carolina, Michigan, Illinois and Ohio. In June, Secretary of the Interior Ken Salazar and the governors of 10 East Coast states signed a Memorandum of Understanding that formally establishes an Atlantic Offshore Wind Energy Consortium to promote the efficient, orderly, and responsible development of wind resources on the Outer Continental Shelf. On April 21, the federal government approved Cape Wind, a 130-turbine wind power project in Nantucket Sound off the Massachusetts coast that is the nation’s first approved offshore wind development. A public-private partnership in New York State is developing a 350-megawatt offshore wind project. The Long Island – New York City Offshore Wind Project would be located about 13 nautical miles off the Rockaway Peninsula in the New York City borough of Queens. The New York Power Authority now is reviewing five proposals from wind developers to build offshore wind turbines in lakes Ontario or Erie. Lawmakers in some lakeside counties have expressed opposition. In addition, NRG Bluewater Wind has proposed wind power projects off the coasts of Delaware, Maryland, and New Jersey; and Deepwater Wind is involved with projects off the coasts of Rhode Island and New Jersey. On August 19, New Jersey Governor Chris Christie signed into law the most comprehensive legislation yet passed by a state to support the development of offshore wind energy. The Offshore Wind Economic Development Act directs the New Jersey Board of Public Utilities to develop and establish an offshore wind renewable energy certificate program that requires a percentage of electricity sold in the state to be from offshore wind energy. There have been some setbacks. On August 20, Duke Energy announced the cancellation of plans to develop a three-turbine offshore wind demonstration project in a lagoon in North Carolina’s Pamlico Sound. Duke blamed high costs and greater than expected environmental impacts. Nevertheless, the U.S. Department of Energy estimates that of the 300,000 MW of wind power that could generate 20 percent of U.S. electricity in 20 years, 50,000 MW would likely be offshore.